Hoover Treated Wood Products, Inc, in business since 1955, supplies a comprehensive portfolio of pressure-impregnated kiln-dried lumber and plywood products for fire retardant and preservative applications. Hoover has multiple company-owned treating facilities, conveniently located to service a 100 plus member stocking distributor network which thoroughly covers the USA and Canada. The rigorous quality control procedures employed by Hoover are constantly reviewed and inspected by Underwriters Laboratories and Timber Products Inspection’s follow-up services. Pyro-Guard® and Exterior Fire-X® lumber and plywood are produced for interior and weather-exposed applications, respectively, and have a flame-spread rating of 25 or less, even after 30 minutes of test time. Both products are clearly labeled and carry the UL® mark. Pyro-Guard® and Exterior Fire-X® lumber and plywood are tested in accordance with procedures outlined in the International Building Code and NFPA 703. 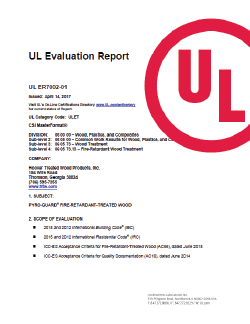 Pyro-Guard® is accepted under UL Evaluation Report ER7002-01 as meeting the requirements of the International Building Code. Pyro-Guard® and Exterior Fire-X® are recognized for applications where noncombustible materials are required in buildings. Examples are nonbearing partitions, nonbearing exterior walls, roof assemblies, platforms, canopies, exterior architectural trim and veneers, exterior balconies, exterior-bearing walls in joisted-masonry and heavy timber construction, and increasingly for decks in wildfire prone areas. Consult our web site, www.frtw.com, for additional information on recognized applications. Hoover continues to be the leader in the preservative-treated wood market with Dura-Guard®, CCA, Cop-Guard, Micro-Guard, and Clear-Guard products. PLYWALL® is a pressure-impregnated preservative-treated ASTM E-90 rated noise barrier, used for highways, commercial sites, residential areas, subdivisions, racetracks, and airports. PLYWALL® is engineered and constructed to your specifications, and quickly shipped to your location for easy installation. Designs from 20 to 60psf will support most applications, while gravel post-backfill insures year round construction options.